AccuWeather Global Headquarters – October 07, 2017 – AccuWeather reports Hurricane Nate is charging across the Gulf of Mexico and will slam the central Gulf Coast of the United States with damaging winds, storm surge, flooding and isolated tornadoes Saturday evening into Sunday. Many preparations for Nate have already taken place, but those still underway will want to be rushed to completion. Anticipation of Nate’s arrival prompted evacuations in low-lying coastal Louisiana parishes and Alabama and Mississippi counties. According to the Bureau of Safety and Environmental Enforcement, it is estimated that approximately 71.1 percent of the current oil production and 53.2 percent of the natural gas production in the Gulf of Mexico has been shut-in. Gasoline and natural gas prices may rise as a result. Nate, currently a strong Category 1 hurricane, remains in a favorable environment over warm water and low wind shear which favors strengthening. Nate is expected to strengthen to a Category 2 hurricane just before reaching land due to these favorable conditions. However, Nate is moving forward at more than 20 mph. This forward speed will limit the storm’s time over water before it reaches land, thus reducing the time it has to strengthen. Regardless of the exact strength, Nate will still bring dangerous conditions to the central Gulf Coast and Deep South Saturday afternoon through Sunday. Conditions will rapidly deteriorate along the central Gulf coast from Saturday afternoon into Saturday night. People should not be on the road during this time. Vulnerable, low-lying coastal areas, such as New Orleans; Mobile, Alabama; Biloxi, Mississippi; and Pensacola, Florida, should treat Nate as a serious threat for flooding from heavy rain and storm surge. New Orleans is below sea level and is protected by levees. Once this water is pushed into the lake, northerly winds on the back side of the hurricane can push the high water levels toward the northern shoreline of New Orleans. Officials have emergency generators on standby for pumping operations in New Orleans, according to NOLA.com. Out of 120 main line pumps, 108 are operational at this time. The fast-forward motion of the storm will push more water inland on its eastern and northern side, when compared to a slow-moving storm of equal strength. Areas just east of the center of Nate will face the greatest storm surge threat, which includes coastal Alabama, Mississippi and the western Florida Panhandle. A storm surge into Mobile Bay is expected as Nate comes onshore. The push of ocean water from Nate, in combination with tides, will put coastal areas under several feet of water from Louisiana to the western Panhandle of Florida Saturday night. People are encouraged to heed all evacuation orders as they are given. In addition to storm surge, heavy rain will also lead to flooding issues for the central Gulf Coast and Deep South. Once Nate moves well inland, the heaviest rain will shift toward the north and northeast of the storm center later Sunday and Monday. Wind gusts will be strong enough to cause property damage, push down trees and lead to power outages. 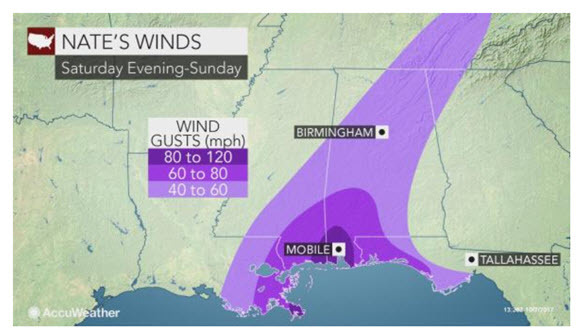 With Nate moving very quickly, wind gusts of 40 to 60 mph will extend far inland across Alabama and into Tennessee near the center of the system. The threat for sporadic power outages will exist across these areas. Isolated tornadoes can also occur well east of the center of Nate on Sunday and Monday. Outer rain bands from tropical systems can quickly spin up tornadoes so folks will want to be on alert. “The extent of the damage will depend, of course, on the precise path and whether the storm intensifies beyond a Category 1 storm,” Dr. Myers said. Wind and wave action will produce rough seas and dangerous surf throughout the Gulf of Mexico this weekend. Small craft throughout the Gulf of Mexico should remain in port this weekend. Bathers should avoid venturing beyond knee-deep water as the number and strength of rip currents will increase substantially, even as far west as Texas. The potential for coastal flooding will extend well east of the center of the storm. Including Nate, there have been 14 tropical storms, eight hurricanes and five major hurricanes thus far.